A version of the famous Namaste blessing as a 5x7 poster by Raphaella Vaisseau. The word namaste itself offers a blessing of oneness for us all. It is a common spoken greeting or salutation used in India and Nepal. It has multi-religious or common usage where it may simply mean "I bow to you." In recent times the term "Namaste" has come to be especially associated with yoga, spirituality and meditation. This version speaks to the essence of namaste, but without the title. 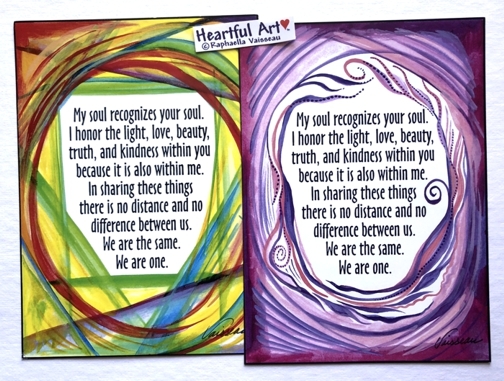 Perfect for students and teachers of yoga to display in their yoga studios, and spiritual seekers of any persuasion. Also a great gift for lovers, friends, and spouses. This beautiful saying comes in many sizes and designs in the traditional version with the title and traditional words. See light in each other. Be love. Center. Breathe. Acknowledge. We are one. Namaste.